Compare funeral directors in Partick and read verified reviews on the UK’s online funeral resource. Use Funeral Zone Listings to find local funeral directors in Partick that meet your specific needs. You can organise the search results by ‘best rated’, 'nearest' or ‘most reviewed’. There is also a handy Google Maps feature so you can see exactly where each funeral home is in relation to each other. 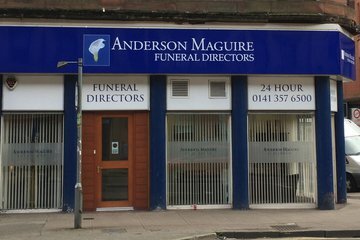 I have nothing but the greatest respect for the staff at Anderson Maguire at Partick. At a time of great personal sorrow I had to arrange the funeral of my young sister, I choose Anderson Maguire and in doing so met three individuals, Maureen, Julie and Chris who could not have been more helpful and considerate and who are a credit to their company and profession. It is my intention to write to Anderson Maguire head office to inform them of the high quality and compassion of their staff at the Partick. Anderson Maguire did a great job organising and ensuring the funeral went smoothly. They listened to our needs and helped us get through a really difficult time. Julie (in Partick) was incredibly helpful and understanding. She was very patient and friendly to us. Made the whole experience very bearable which is challenging. Thank you very much! Staff were extremely efficient, helpful and supportive. The staff were very compassionate and understood our feelings at such a sad time for our family. A special mention to Maureen, who, after speaking to her initially in the phone, resolved my decision to proceed with you as undertakers for Joanne's cremation. I had spoken to one other funeral director, who came across as very cold and clinical. Maureen took us through the funeral organising process with compassion, empathy and efficiency. The cremation cortege, service and subsequent reception proceeded without any hitch. Thanks to Cathleen the celebrant for organising the eulogy and Lynn at head office for overseeing the Order of Service. I would have no doubt in recommending you. Thank you from Joanne's family. 8th January 2019. Professional and kind staff, we were able to trust them through all stages of planning my dad’s funeral. I would definitely recommend them.